The title sums up the last week of weather. And it was pretty much a state of being, but not really a state of mind. Not all of the meetings were meaningless. In fact most of them were worthwhile gatherings. But they have been mentally taxing. Leaving work on Thursday I was absolutely exhausted, mentally. Which usually makes me feel physically exhausted as well. It made me reflect on why I work where I work, and why was it so difficult right now. I like working for the District because I get to help people get service for their homes and lives. They don’t always like what I require for the initiation of service, but in the end they have a place to live (or sell). We have over 10,000 new customers since I started. Enough to have created a new city. It is certainly not my personal doing, but I am a good little cog in the machinery. What has made work become a bit of a millstone is a bit of an attack on the District. It is rather like having a really bad neighbor. You would really like to move (or have them move), but it is no feasible for many reasons. You think your neighbor is poisoning your cats, could maybe prove it, but they are friends with the police chief. Then the chiropractor thanked me for keeping my appointment, even though I was tired. And we went to yoga. And the exhaustion lifted just a bit. Enough to get to work again the next morning, and of course the next (there will be no meetings TODAY!). Anyway, on the home front we (i.e. CARL) are making some progress. The floor is surrendering bit by bit. The elephant in the middle of the room remains, although the baby elephant is working its way to the non-work side of the plastic. I am hopeful that we will be down to a next stage by the end of next weekend. And if it rains again we should be able to see where the rain gets in. 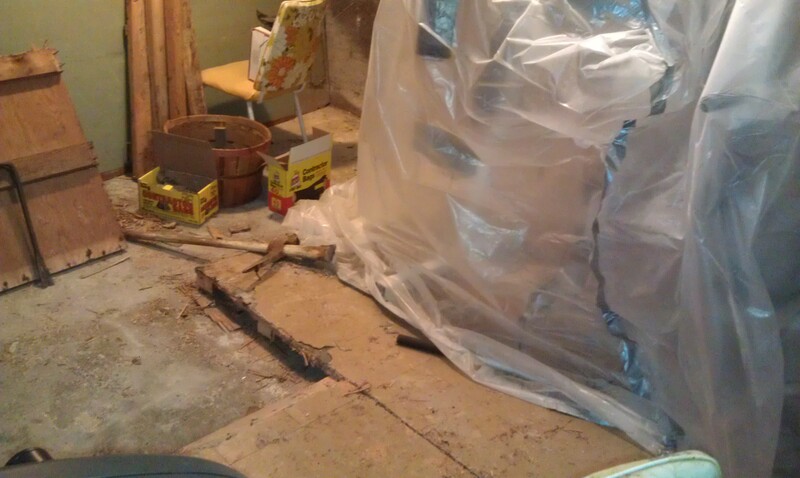 For those that are acquainted with my past – there is a wooden 1/2 bushel basket near the wall. This was a laundry basket in an earlier incarnation – with a nice flowered vinyl insert. And before that it held oranges or grapefruits sent from Florida to my parents, I think by Don & Katie. 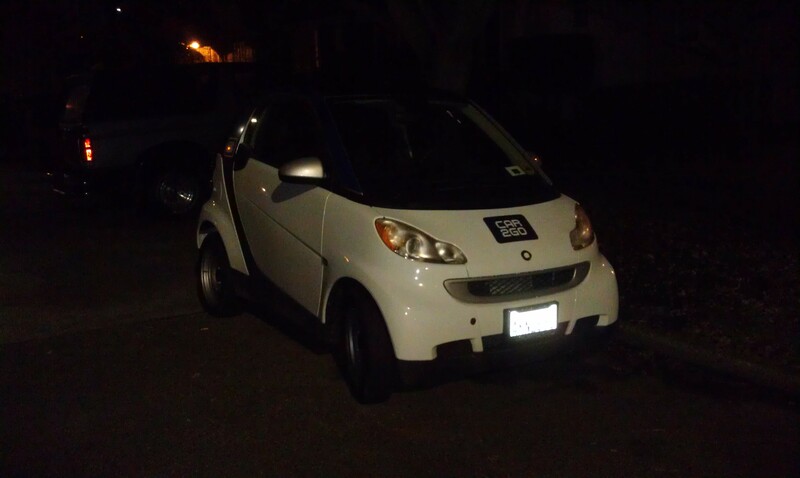 And in other news they have started a program called Car2Go in parts of Seattle. I read about it in the newspaper, and then spotted a car across the street from our house. Also saw one over by Greenlake. I don’t know that this service would make sense for us, but it is an alternative to the other shared car services that I am sure will find a niche. The size of the cars means it is for moving yourself and a friend or two. This entry was posted on January 19, 2013 at 11:03 am and is filed under Uncategorized. You can follow any responses to this entry through the RSS 2.0 feed. You can skip to the end and leave a response. Pinging is currently not allowed. Our meetings in education are sometimes fruitful, but mostly enough to make me want to pull out my hair. I’m hating this cold fog. It’s gray and depressing! Is the car like the ZipCar program? If my life were a different circumstance, I would try the ZipCar. Different is the short answer. We have zip cars too. The car2 go plan is based on a density of cars, not so much on reservations.